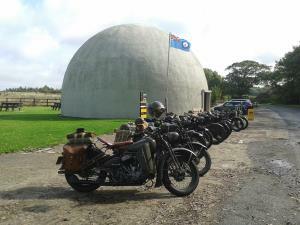 Langham Dome was key to our WW2 effort in providing a training facility for the anti-aircraft gunners who protected our coasts. It has been refurbed to tell the story of the technology behind the training gun, and of life on the airfield and in the surrounding villages. Langham Dome offers plenty for all visitors. In addition to the interpretation about the Dome and its use during the war, there are interactive quizzes, jigsaw puzzles, dressing up clothes, the chance to have a go on our replica training gun, together with a delightful picnic area and light refreshments served from our café in July and August. We have ample free parking and a delightful picnic area. Light refreshments are available in July and August. By car: Situated on the Langham to Cockthorpe road, in the middle of Langham Airfield. Instantly recognisable as a Dome next to the road.